While much of Costa Rica has been stripped of its forests, the country has managed to protect a larger proportion of its land than any other country in the world. In 1970 there came a growing acknowledgment that something unique and lovely was vanishing, and a systematic effort was begun to save what was left of the wilderness. In that year the Costa Ricans formed a national park system that has won worldwide admiration where many of the treasures of Costa Rica can be found. In this effort to preserve much of Costa Rica’s natural beauty and surroundings, over 25% of the country’s land has been set aside and turned into protective parks, refuges and reserves. 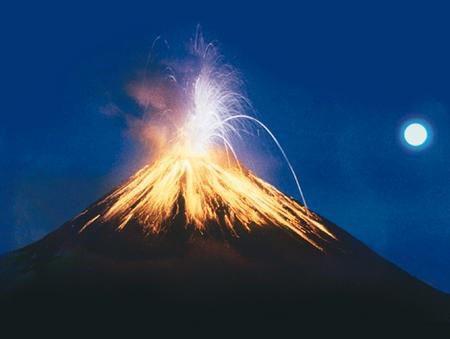 10% of land, once compared to Eden, has been designated for Costa Rica's 26 national parks. An additional 17% has been legally declared and set aside for the country's 58 wildlife refuges, 32 protected zones, 15 wetland areas/mangroves, 11 forest reserves and 8 biological reserves. In total, there are 12 conservation regions that protect the distinctive and diverse natural habitats found throughout the country. The careful tourist can view spectacular scenery with a choice of mountains, volcanoes, waterfalls, rapids, cloud forest, rainforest, beaches, and much, much more. Amidst these incomparable land and marine areas live thousands of species of mammals, birds, fish, reptiles, amphibians, butterflies and insects, who co-exist naturally in their habitats. Park, Reserve and Refuge locations are indicated on the map above. Click on the links below to take a quick trip through these incredible, unique areas! 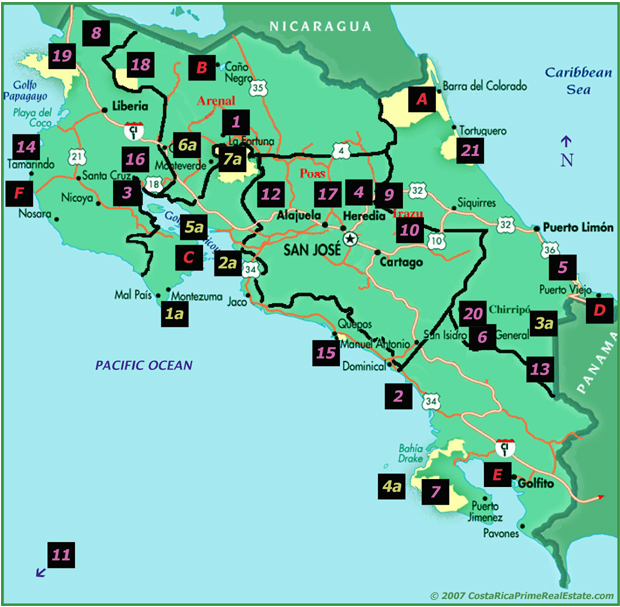 National Parks: The Yellowstones and Yosemites of Costa Rica--the lure for 90 percent of all visitors to the park system--are Manuel Antonio, with its beautiful beaches; Braulio Carrillo, with its rainforest beside a highway; Tortuguero, a watery, forested world teeming with wildlife; Irazú, where on a clear day you can see both the Caribbean and the Pacific; and Poás, where you can peer into a steaming crater and see the earth's crust being rearranged. Depending on your interests, you are sure to find at least one park you will want to see. Entire books are written on each of the parks! National Wildlife Refuges: Costa Ricans are very "green" in their thinking, and have taken the steps necessary to protect endangered and shrinking wildlife populations. Here is a listing of some of the Wildlife Refuges of interest. Besides providing Costa Ricans and foreign travelers with the privilege of admiring and studying the wonders of nature, the national parks and reserves protect the soil and watersheds and harbor an estimated 75 percent of all Costa Rica's species of flora and fauna, including species that have all but disappeared in neighboring countries. National and Biological Reserves: In addition to the thousands of hectares that have been carefully protected and put aside for national parks and wildlife refuges, this conservation-thinking country has found even another way to protect the wildlife of more special species, as well as the natural beauty of their land.